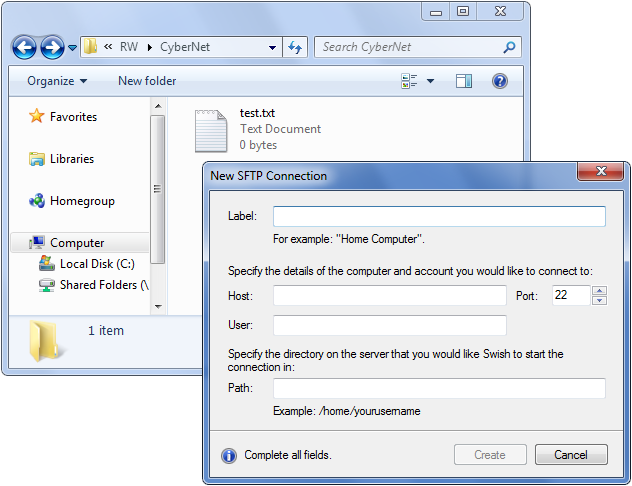 In Windows you can make connections to FTP clients, but when it comes to connecting to an SFTP server you’ll need to turn to a third-party application. Swish tries to bring the missing SFTP integration to Windows Explorer with a fast and free download. Vista/Windows 7: Open Computer. Double-click on the Swish icon. Click the Add SFTP Connection button. Complete the details in the dialogue and click OK. You should see a new connection appear in the Explorer Window which you can double-click to access. Windows 98/2000/XP: Open My Computer. Double-click on the Swish icon. Select Tools from the menu bar and then Add SFTP Connection. Complete the details in the dialogue and click OK. You should see a new connection appear in the Explorer Window which you can double-click to access. File management: renaming, deletion etc. The only downside I saw with this app is that the full Windows Explorer context menu is not at your disposal. When you right-click on a file you’ll see a minimal set of actions you can take on a file, which makes sense considering the files aren’t located on your machine, but it would have been nice to have the full context menu available.